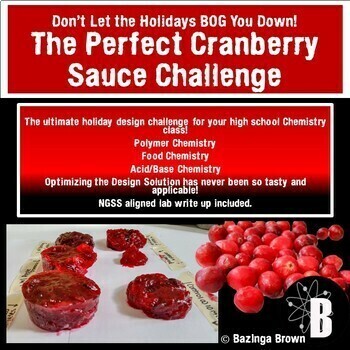 Have your students design their own lab to create the best, most stable gel in this cranberry sauce challenge. Background information about pectin and how it stabilizes cranberry sauce and other jams and jellies is included. Students then choose from multiple different variables (pectin levels from apple/citrus, time, temperature, filtering, etc.) to try to create the most stable cranberry sauce product. Full of polymer chemistry, acid base chemistry and food chemistry this lab is sure to please a crowd and be applicable to their holiday festivities! NGSS aligned, this lab incorporates a write up for students to complete that includes Claim, Evidence, and Reasoning as well as a section that asks them to MODEL how the variable they chose is believed to be affecting their cranberry sauce consistency at the molecular level.